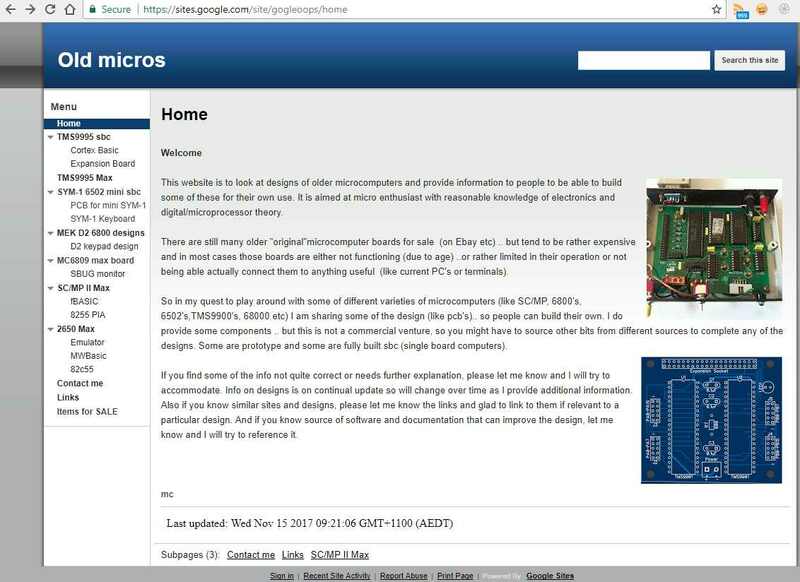 The website https://sites.google.com/site/gogleoops/home is to look at designs of older microcomputers and provide information to people to be able to build some of these for their own use. It is aimed at micro enthusiast with reasonable knowledge of electronics and digital/microprocessor theory. There are still many older “original”microcomputer boards for sale (on Ebay etc) .. but tend to be rather expensive and in most cases those boards are either not functioning (due to age) ..or rather limited in their operation or not being able actually connect them to anything useful (like current PC’s or terminals). So in my quest to play around with some of different varieties of microcomputers (like SC/MP, 6800’s, 6502’s,TMS9900’s, 68000 etc) I am sharing some of the design (like pcb’s).. so people can build their own. I do provide some components .. but this is not a commercial venture, so you might have to source other bits from different sources to complete any of the designs. Some are prototype and some are fully built sbc (single board computers). I started adding datasheets to a new page called Datasheets! Now with 6530 and 6500/1. I discovered more unique 65xx IC’s in my stash of boards. So more 6502, 6521, 6545,6522 and 6522 shown here!